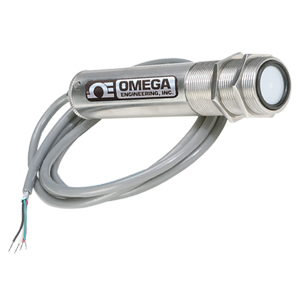 The Omega compact high performance industrial infrared sensor/transmitter model OS137A, provides a variety of features and options packaged in a small stainless steel housing. The standard features are adjustable emissivity, 10 to 1 optical field of view, adjustable alarm set point and voltage output to drive external relays, and 6 pre-selected analog outputs that can easily be interfaced to all meters, controllers, data loggers, recorders, computer boards, and PLCs. The unit comes with 2 hex nuts, 1.8 m (6') shielded cable for power and output connections, and an operator’s manual. Note: * Insert “1” for 0 to 100°C (32 to 212°F); Insert “2” for -18 to 260°C (0 to 500°F); Insert “3” for -18 to 538°C (0 to 1000°F). Comes complete with two mounting nuts and operator’s manual. To order with longer power/output cable, up to 30 m (100'), add suffix “-(**)FT” to model number, and add an additional cost for each additional foot over 1.8 m (6'). ** Specify length in feet. † OS137-LS laser sighting: 1 unit suitable for aligning multiple heads. Used during installation only.